History and civil rights are intertwined at the Tuskegee Airmen National Historic Site at Moton Field in Tuskegee, Alabama. Moton Field was a training flight facility for African American pilot candidates in the U.S. Army Air Corps during World War II, operating from 1941-45. The airfield was named for Robert Russa Moton, second president of the Tuskegee Institute, then a black teachers college. Through the extant buildings and interpretive exhibits, the National Park Service (NPS) commemorates the Tuskegee Airmen’s contributions to World War II, recognizing the first African American military aviators and their struggle for civil rights during the 1940s. This essay examines the way in which race, oral histories, objects, and sensorial experience (sight, sound, touch, and smell) are used at the Moton Field to point out the significance of the Tuskegee Airmen to American history. Despite the segregation and racism that they experienced in the U.S. military, the African American pilots and the women and men who worked alongside them believed staunchly in the idea of service to the nation as a means of participating in democracy and gaining full citizenship. Fig. 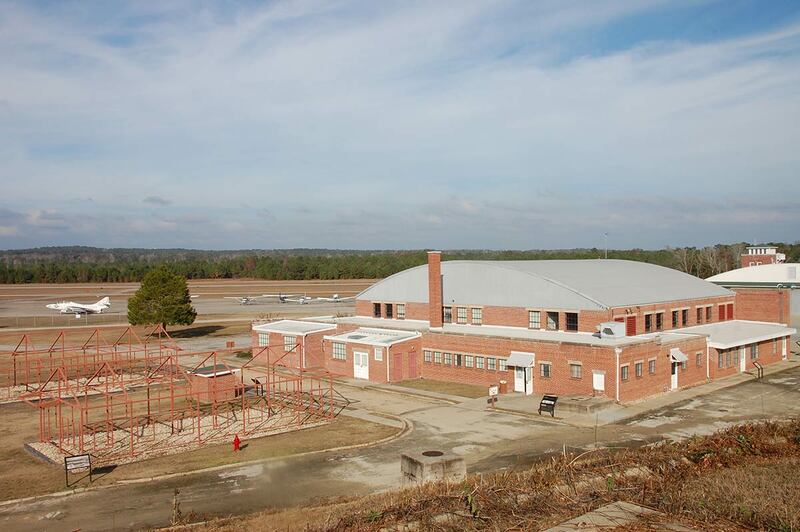 1: Hangar One and Ghost Structures, Tuskegee Airmen National Historic Site, Tuskegee, Alabama, November 2013. Photo courtesy of Renée Ater. Through the object labels and informational text panels displayed in the main exhibit hall as well as the incorporation of oral histories in the form of audio, the historic site challenges and tempers the “Good War” myth, complicating the story of American valor with a story of American race relations as well as presenting a heroic story of African American commitment in the face of social and political injustice. The Tuskegee Airmen National Historic Site asserts the NPS’s desire to create an alternative memory of World War II. Historian John Bodnar argues, “public memory emerges from the intersection of official and vernacular cultural expressions” (13). He proposes that official forms of memory originate in the concerns of cultural and political leaders at the local and national level who are vested in “social unity, the continuity of existing institutions, and loyalty to the status quo,” presenting the past through the lens of “timelessness and sacredness” (13–14). Vernacular cultural expressions are rooted, he suggests, in specialized interests with diverse and changing views of the past. Vernacular culture is based in community relations and the social reality of the local—everyday lived experiences matter (14). The Tuskegee Airmen National Historic Site is an interesting case study because it shows the complex and intertwined relationship between official and vernacular interests. It was established as a federally mandated project with specific guidelines for commemoration; it coexists with the existing tribute stories Americans tell about World War II; and it foregrounds the memories of the African American men and women who trained and worked at Moton Field. The NPS is interested in shifting viewers’ received understanding of World War II. Nuancing the national narrative about the war and American identity, the NPS raises important questions about what constitutes patriotism, service, and sacrifice. In Memorial Mania, Erika Doss states that “[t]he purpose of war memorials is to honor soldier dead and to acknowledge social debt: thanks are expressed to those who died for a nation, on behalf of a cause” (190). 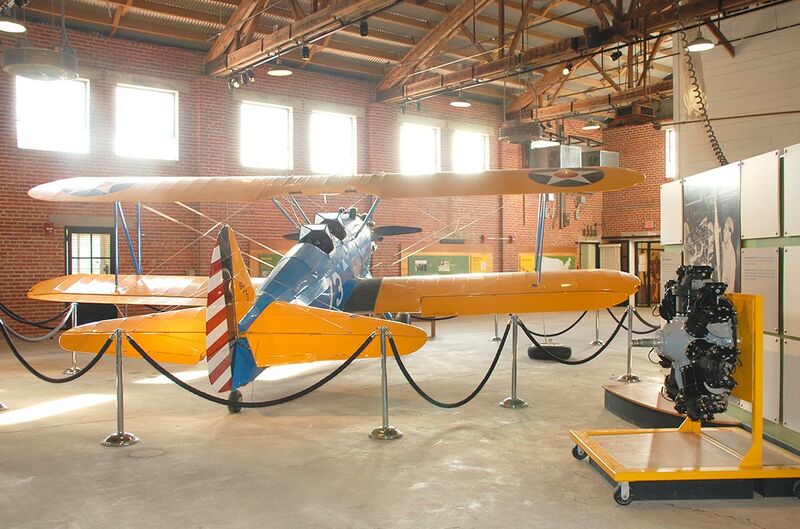 The Tuskegee Airmen National Historic Site acts as both a memorial and as a place where history is interpreted. The NPS honors the service of and acknowledges the social debt to African American pilots within the historical reality of segregation and racism in the United States. As Bodnar points out, the NPS has struggled historically to present such diverse and complicated stories of the past even while it “became a powerful shaper of historical images and messages for the American public” (Bodnar 170). For the past decade, the NPS has shifted the manner in which it presents U.S. history, according to historian Edward Linenthal, concentrating on civic engagement and public history at its sites through the “telling of untold stories” and the preservation of sites that represent the complexity of the American experience (123). As Linenthal notes, the NPS’s civic engagement program strives for an interpretive process that “respects diverse, often conflicting voices on American public culture and seeks to honor the voices of past Americans too long forgotten, too long existing at the margins of national stories in which they counted in so many important ways” (129). 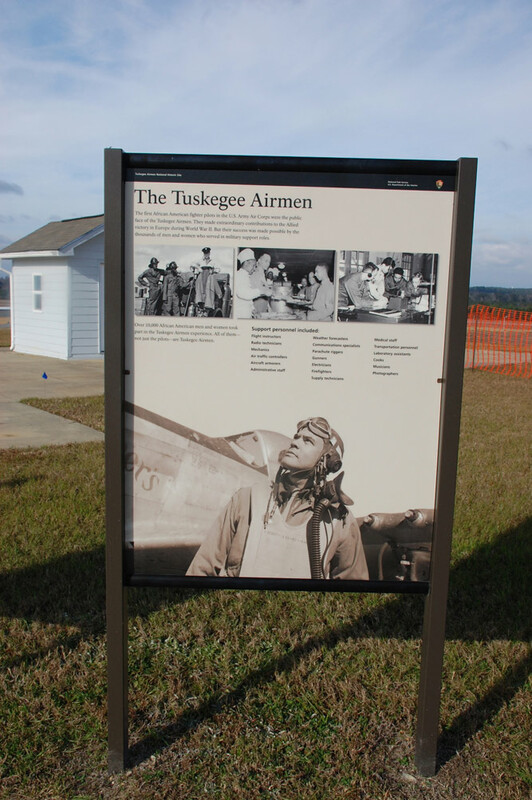 The NPS understands the Tuskegee Airmen Historic Site to be of national significance for the reasons given above, but also because the Tuskegee Airmen fought for “the preservation of democracy and human rights for all peoples” (Moton Field/Tuskegee Airmen Special Resource Study xiii). In the late 1930s African American leaders demanded greater involvement in the U.S. military, lobbying for black men to have the opportunity to become pilots. In 1939, Congress passed the Civilian Pilot Training Act in order to train a large number of pilots who could work in military aviation if needed, and which allowed African American men to earn their civilian pilot’s licenses albeit through a segregated program. A year later, the U.S. Congress and President Franklin Roosevelt approved the Selective Training and Service Act. With this act, African Americans were finally admitted into combat units, but also on a segregated basis. The War Department selected Tuskegee, Alabama, as the suitable site for a new airfield because the Tuskegee Institute was already running the Civilian Pilot Training Program at the small Kennedy Field and the region’s climate was suitable for year-round flying. In July 1941, Moton Field officially opened; the first thirteen candidates arrived in Alabama to commence their training, only five passed the arduous training program. Four years later, nearly 1,000 aviators were trained at Moton Field as America’s first African-American military pilots for the U.S. Army Air Corps (Moye, Freedom Flyers 13–40; Percy 775–80). For nearly sixty years, there has been a lack of public knowledge about the Tuskegee Airmen, as well as an omission in the historical record of their efforts. Several events marked the retrieval of their role in World War II. In March 2007, President George W. Bush presented the black aviators with the Congressional Gold Medal, the highest honor that Congress can bestow on civilians (“Tuskegee Airmen,” Washington Post). In early December 2008, President Barack Obama invited the surviving Tuskegee Airmen to attend his first inauguration in Washington, D.C. (“Inauguration,” New York Times). Although President Clinton directed the NPS to create a national historic site in 1998, it took a decade for the NPS to assemble materials, collect oral interviews, and create the exhibits. The historic site was officially dedicated on October 10, 2008, with surviving Tuskegee Airmen, federal and state officials, and other dignitaries in attendance. Fig. 2: “The Tuskegee Airmen” Text Panel, Tuskegee Airmen National Historic Site, Tuskegee, Alabama, November 2013. Photo courtesy of Renée Ater. Today’s visitors arrive at Moton Field along a rural road, passing through fields and wooded areas, and gradually driving up a small hill that overlooks Moton Field. From a large public plaza that offers a panoramic view of the airfield, visitors begin their tour in front of three large text panels. The three text panels establish the historical parameters of the story to be told at the historic site. The first panel, “They Came to Tuskegee,” lets visitors know that African Americans traveled from all over the United States to participate in the pilot-training program and indicates the significance of Moton Field for their endeavors. The second panel, “Tuskegee Airmen,” prepares visitors for a polyvocal story. Visitors are informed that “the first African American fighter pilots in the U.S. Army Air Corp were the public face of the Tuskegee Airmen.” But the text also tells visitors that thousands of men and women in support roles including flight instructors, mechanics, parachute riggers, cooks, and medical staff contributed significantly to the success of the pilots. This use of multiple voices carries through the entire site, both in the exterior building labels and in the main exhibit hall, and encourages diverse readings of the meaning of World War II for African American military personnel, their white officers and trainers, and the civilians who worked alongside them. After reading these text panels, visitors descend from the plaza along a gently graded path that winds down to the historic site. Throughout, interpretive panels include text, black-and-white photographs from the era, and quotations (read/spoken by the voices) from men and women who participated in the so-called “Tuskegee Experience.” Currently, one building is open to the public—Hangar One, which houses the main exhibit hall. Red steel-framed structures, called “ghost structures,” stand in for the buildings that no longer exist. Dedication, determination, and community are the leitmotifs of the Tuskegee National Airmen Historic Site. Fig. 3: Interior of Main Exhibit Hall, Hangar One, Tuskegee Airmen National Historic Site, Tuskegee, Alabama, November 2013. Photo courtesy of Renée Ater. Inside Hangar One are the visitor center, gift shop, and main exhibit hall. As visitors transition from the visitor center/lobby to the main exhibit hall, two wooden walls frame the hallway. 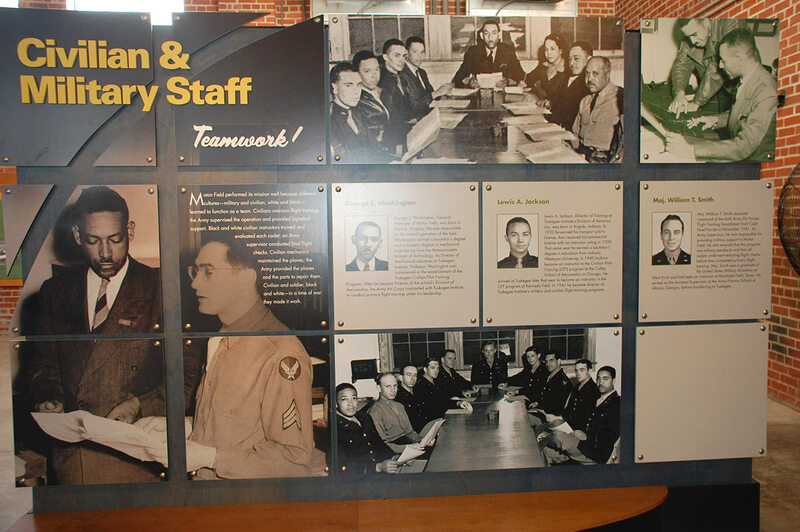 The text and photographs on these walls focus on the importance of the airfield as the primary flight training school for African Americans, the rigors of flight school, and the role of black pilots in World War II. In addition, the NPS stresses the difficulties of Jim Crow laws and the segregated army for the cadets. This counternarrative highlights the experiences of discrimination in the U.S. military and is emphasized in every aspect of the museum interpretation at the historic site. J. Todd Moye, then director of the Tuskegee Oral History Project, notes, “a major goal of the project is to document the Double V campaign (victory over fascism overseas coupled with victory over racism and discrimination at home as it was lived by millions of African Americans during the war),” arguing that the airmen were “among the first activists in the modern American civil rights movement” (Moye, “Tuskegee Airmen” 584). The first things visitors notice are the array of historic objects in the exhibition: two training airplanes, a plane simulator, an engine, parachutes, clothing, and other objects occupy the main exhibit hall. In Hangar One, visitors receive a multisensory experience: they can read extensive texts, touch articles of clothing and fold parachutes, listen to audio clips of the men and women who worked at Moton Field, and even smell the remains of oil and dust. This notion of the multisensory experience of the past is key at the historic site. The tactile nature of many of the displays allows visitors to physically sense the past, not just read about it. Nina Levant and Alvaro Pascual-Leone describe the museum experience as “a multilayered journey that is proprioceptive, sensory, intellectual, aesthetic, and social” (xiii). Simply put, visitors have a bodily experience of the past at the Tuskegee Airmen National Historic Site. Through touch and smell, sight and sound, visitors are meant to relocate to another era, to have the sense of witnessing the past. In Sense of History, David Glassberg proposes, “[s]ense of history is akin to what environmental psychologists describe as sense of place . . . a sense of locatedness and belonging. Sensing history, we explore fundamental questions of concerning personal and group identity and our relationship to the environment” (7). He identifies three aspects of the sense of history that locates us: space, time, and society. According to Glassberg, our sense of history derives from our intimate experiences of the past and it interacts with public histories. At the Tuskegee Airmen National Historic Site, this sense of history is triggered through visitors’ physiology; through visitors’ own intimate location in space, time, and society; and finally, through the way that public history provides meaning to the place. Fig. 4: “Civilian & Military Staff” Text Panel, Hangar One, Tuskegee Airmen National Historic Site, Tuskegee, Alabama, November 2013. Photo courtesy of Renée Ater. Four main themes are covered in the exhibition with subsidiary information included in smaller wall labels. The first large text panel highlights “Civilian & Military Staff—Teamwork” providing detailed biographical information on military officers and civilian employees. It also underscores the cooperation between African Americans and European Americans necessitated by the project. The second theme emphasizes “Intelligence—Orienting Cadets to War.” In this text panel, visitors read about the role of “war orientation,” in which cadets learned of the latest news from the war front and practiced identifying enemy weapons, vehicles, and ships. The “Operations—We Teach Them to Fly” text panel underscores the primary flight training of cadets including their physical training and preflight training in flight physics, navigation, meteorology, radio procedures, and aircraft recognition. In the final major thematic panel, “Maintenance—Keep Em Flying,” visitors learn about the important role of maintenance. Civilian mechanics and ground crews are described as essential members of the flight team, who kept the training planes flight worthy. Throughout the main exhibit hall, visitors are reminded that Moton Field was a place of collaboration, careful learning, and concerted effort. Fig. 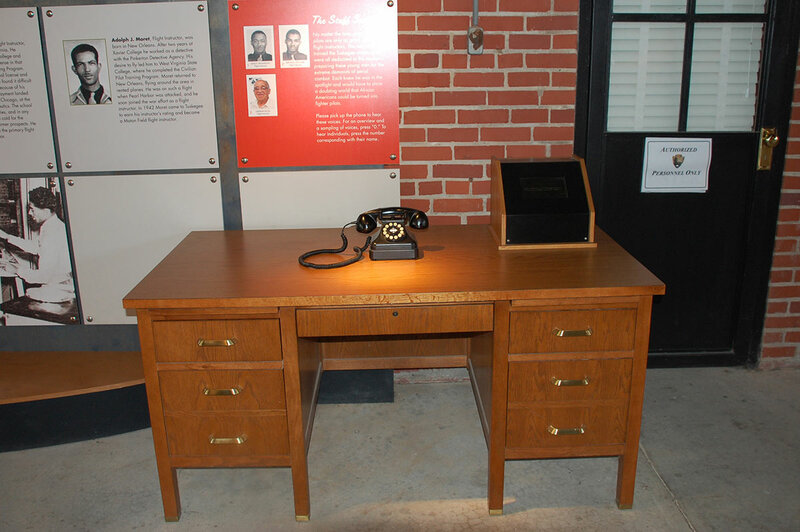 5: Telephone, Hangar One, Tuskegee Airmen National Historic Site, Tuskegee, Alabama, November 2013. Photo courtesy of Renée Ater. Lifting up the earphone and listening, visitors experience an intimate connection between themselves, the speaker, and history. Visitors hear stories of struggle and triumph, of humor and seriousness. In one interview, William Walters of Columbus, Ohio, talks of his experience with pride. He worked as mechanic at Moton Field. After the war, he graduated from Tuskegee Institute with a degree in mechanical industries. Speaking of his hard work and dedication, William remarked: “We realized that [being a mechanic] was our job, we were not the showoffs or the big shots or anything like that, we had a job to do and we were proud of our job.” Through these oral histories, the men and women of the Tuskegee Experience convey their perspectives on life and work at the airfield. The scratchy quality of the recordings implies past time, but also lends an “authentic” quality to the voices of those interviewed. As visitors listen to these stories, they look around Hangar One and imagine the varied activities of the busy airfield. They can take in the visible remains of the building, the brightly colored airplanes, and the black-and-white photographs. Visitors are meant to have a physical sensation of the past, to connect the struggles and triumphs of the Tuskegee Airmen to their own lives in the twenty-first century through sensory interaction. The Tuskegee Airmen National Historic Site is a memorial and a place of commemoration—a place to acknowledge the vital role of African American pilots in World War II and the team of women and men who supported them. The historic site provides an alternative history to the “Good War” as a “celebratory narrative of national unity and democratic triumph” (Däwes and Gessner) Instead, visitors are encouraged to think about issues related to racial discrimination and segregation in the military in the United States during the 1940s and to consider the difficulties, perseverance, and skills that African Americans needed for the U.S. military. For the NPS, the Tuskegee Experience serves as an “excellent model to demonstrate the two-fold battle African Americans encountered in their push to serve in the United States armed forces. . . . the Tuskegee Airmen Experience clearly illustrates the African-American community’s effort to eradicate military racism and their desire to eliminate social racial discrimination altogether” (Moton Field/Tuskegee Airmen Special Resource Study xiii). The NPS has created a multifaceted history at the historic site, stressing the struggle of African Americans for equal rights over a thirty-year period. It is a site indebted to the heroism and victory discourse of World War II, but it also uses the valor of the pilots to foreground stories of triumph and success, of unfair treatment and failure, and of the consistent resistance to the deeply held beliefs of those who imagined a limited role for African Americans in shaping American society and national identity. The Tuskegee Airmen National Site is a place where the accretion of individual African American voices narrates a more inclusive and expansive past. Questioning the “Good War’s” Memory and Meaning in Contemporary America.” American Studies Association (ASA) Annual Meeting Beyond the Logic of Debt, Toward an Ethics of Collective Dissent. Washington, D.C., 24 Nov. 2013. Panel Abstract. Doss, Erika. Memorial Mania: Public Feeling in America. Chicago: U of Chicago P, 2010. Print. Glassberg, David. Sense of History: The Place of the Past in American History. Amherst: U of Massachusetts P, 2001. Print. History in the National Park Service: Themes and Concepts. Washington, DC: National Park Service, 2000. Print. Levent, Nina, and Alvaro Pascual-Leone. The Multisensory Museum: Cross-Disciplinary Perspectives on Touch, Sound, Smell, Memory, and Space. Lanham, MD: Rowman and Littlefield, 2014. Print. Linenthal, Edward T. “The National Park Service and Civic Engagement.” The Public Historian 28.1 (Winter 2006): 123–29. Print. Moton Field/Tuskegee Airmen Special Resource Study. Atlanta: Southeast Regional Office, National Park Service, October 1998. Print. Moye, J. Todd. “The Tuskegee Airmen Oral History Project and Oral History in the National Park Service.” Journal of American History 89.2 (2002): 580-87. Print. Moye, J. Todd. Freedom Flyers: The Tuskegee Airmen of World War II. Oxford: Oxford UP, 2010. Print. Percy, William Alexander. “Jim Crow and Uncle Sam: The Tuskegee Flying Units and the U.S. Army Air Forces in Europe during World War II.” Journal of Military History 67 (July 2003): 773–810. Print. Thomas-Lester, Avis. “Tuskegee Airmen Receive a Nation’s Salute.” Washington Post 30 March 2007. Web. Seelye, Katherine Q. “Inauguration is a Culmination for Black Airmen.” New York Times 9 Dec. 2008. Web. Title III—Tuskegee Airmen National Historic Site, Alabama. Public Law 105-355. 112 Stat. 3254. 6 Nov. 1998. Print. Renée Ater is associate professor and associate chair in the Department of Art History and Archaeology at the University of Maryland. She holds a B.A. in art history from Oberlin College, and earned a M.A. and Ph.D. in art history from the University of Maryland. Her scholarship and teaching focuses on American art of the nineteenth and twentieth centuries with a specialization in African American visual culture. She is the author of Keith Morrison, volume 5 of The David C. Driskell Series of African American Art (Pomegranate Books, 2005) and Remaking Race and History: The Sculpture of Meta Warrick Fuller (University of California Press, 2011). Her new book project entitled Unsettling Memory: Public Monuments to the Slave Past in the United States considers the flurry of monument building to commemorate slavery, resistance, and emancipation in the late twentieth and early twenty-first centuries in American cities in the South, Midwest, and Northeast. Ater, Renée. “Commemoration, Race, and World War II: History and Civil Rights at the Tuskegee Airmen National Historic Site.” American Studies Journal 59 (2015). Web. 24 Apr. 2019. DOI 10.18422/59-05.